Before anything else regarding the movie is mentioned, I would like to stress that we all have a complexity of opinions. And as humans with rational reason, we are all respected for having that ability. As a member of the sapien sapien species (and don’t dare question that! ), I, for instance, is definitely permitted to say anything as a reaction to the movie. And to warn you, it would be very violent. It took me weeks to recover from whatever I am experiencing. And it took me weeks to make this feeling at least settle, thinking I might eventually be glad with the whole thing, but it has shown no signs of sparks, and only Edward did. 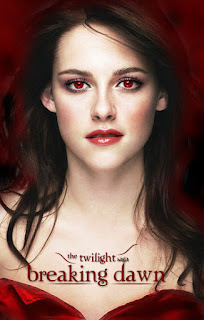 The title “Breaking Dawn” is, forgive me for saying, metaphorically incorrect in comparison to my experience with the movie, even the Twilight Saga as a whole. Because, compared with the preceding installments, Breaking Dawn is the most depressingly gloomy of all the overrated, “artificially-lit”, shallow movies even though the name itself implies that we are to expect so much from it, and sad to say, I was disappointedly disappointed. To tell you, I used to be an avid fan of Twilight before a friend showed a very long (probably a total disappointment at the writer’s side) book review of the five novels. You might think this is kind of bias since she hates the novel and the movie, and I hated her for that. It says, “I forgot I was reading five chapters now and still nothing happens. It feels like reading half of a chapter.” As I think about it, it’s actually just a waste of paper (it could probably be used in some other more important things), spending so many with dry conversations especially those of Edward and Bella. They’re like monosyllabically-speaking teenagers talking just for the sake of answering their parents and not to get their allowance cut for the next day. Can’t the author think of a more elaborate and less boring “side” stories just to make everything lengthy or a brilliant idea, CUT IT SHORT! Since I have already started this, therefore, even though I really hate to, I shall finish it by telling myself that everything’s gonna be okay.